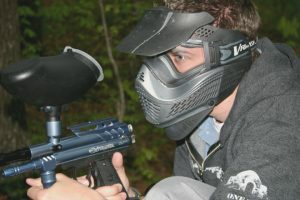 A recent news article from Philly.com takes a look at the high risk of suffering an eye injury while engaged in paintball activities. To be clear, we are talking about people engaged in sanctioned paintball completions like the ones held a paintball centers around Boston and throughout Massachusetts. The results of a recently completed study show that, while there is technically a higher risk of a participant suffering an eye injury while participating in a sport such as basketball, baseball, and bicycling, the risks from paintball often result in a partial or total loss of vision for at least some period of time if not permanently. One of the reasons that eye injuries occur less often in paintball is that the participants are required to wear eye protection when participating in any activities. However, if players are not wearing eye protection, then it is likely that when a paintball makes contact with a person’s eyes, it will result in a serious personal injury. However, it is not only if the participant is not wearing any eye protection, but also if they are wearing broken, defective, or improperly fitting eye protection. Since many people do not own any paintball equipment, they tend to rent it from the paintball center. If you were injured at a paintball center, and it was due to faulty equipment or failure to warn you of a known danger, you might have a valid personal injury claim against that defendant. However, as our Boston personal injury lawyers can explain, when you go to any type of recreation facility that involves an activity with some type of inherent danger, they will likely have you sign a waiver. This is true of paintball centers, ski areas across Massachusetts, and a whole host of other types of recreation. The question at hand is whether signing a waiver will limit your ability to file a lawsuit in the event you suffer a personal injury. The first thing to mention is that you have signed the agreement never having read it or physically signing anything. While this seems strange, many will simply flash a warning on a screen and ask you to check a box, or sign on a signature pad instead of a printed warning that you actually get a chance to read. All of this comes into to play when determining if you actually signed away your rights to filing a Boston personal injury lawsuit. If you purchased your tickets and then were asked to sign or acknowledge a waiver as almost an afterthought, this might be considered an invalid waiver, because it was not a bargained-for exchange, which is a requirement to form a valid contract. The court will also look at the terms of the agreement and see if they are devoid of any degree of equity or fair dealing. It is also important to understand that, in addition to limits on liability, there are also choice of law provisions, and a requirement to submit to arbitration rather than going to court.